Garden weddings are lovely celebrations. There is something so welcoming about a gathering in a garden. If you’re considering hosting a garden wedding but are not sure about renting out a venue, rest assured that you can definitely use your backyard! Planning and hosting a garden wedding can be totally enjoyable with the right attitude and approach. My husband and I were married in the summer of 2015 in our backyard. Before we started planning our wedding, we thought a lot about how we wanted the day to feel. It was important to me that our guests have a great, memorable time. It was also important that we not feel stressed about spending too much money on a single party. Most of all, we wanted to feel surrounded and supported by those we loved. We decided to host a relaxed event where our friends and family could be themselves and have a good time while still having a special celebration. Hosting the wedding in our backyard seemed like the perfect fit! This post details how we hosted our garden wedding. To check out the pretty pictures of how everything turned out, visit this post about our wedding. This post explains how we dealt with each of these things to put together an easy celebratory day for ourselves and our friends and family. It’s possible to do an entire wedding DIY-style, but we found we had a much more relaxed day when we hired out the key day-of activities. For instance, we did DIY decor but had a flower farmer put together bridal bouquets. We did DIY appetizers and drinks but had a local restaurant cater the dinner meal. Do what you can before the date, but don’t be afraid to hire professionals to help you with the things that really do need to go right on the day (and that you just don’t have time to do yourself when you’re in your fancy clothes!). My bridesmaids were so boss inspecting all the supplies in the days before the wedding! The morning after the wedding, we were incredibly fortunate to that our family and friends helped clean up. 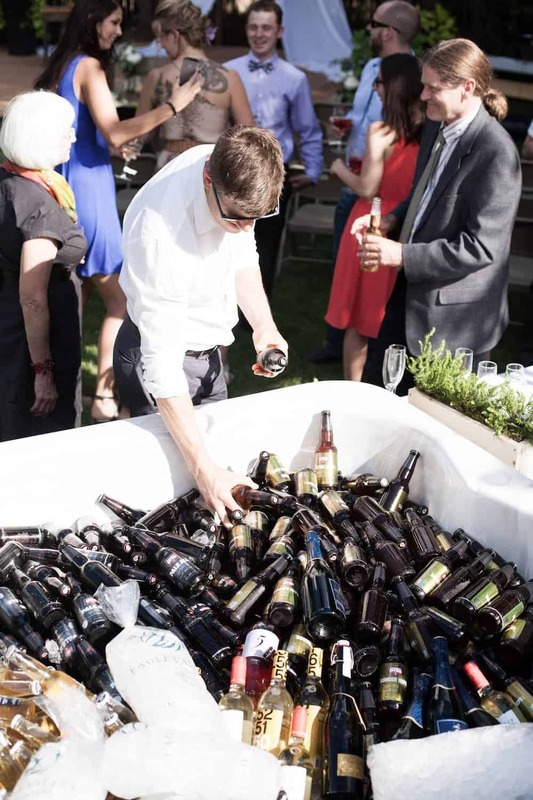 If you’ve ever cleaned up after a BBQ…just imagine the mess after a party with over 100 people! I’m so grateful to have had the dedicated help of my friends and family before, during, and after the wedding. If you’re so lucky, thank these people over and over again. They’re really who make the wedding event possible! I admit that we are pretty fortunate to have a large yard. 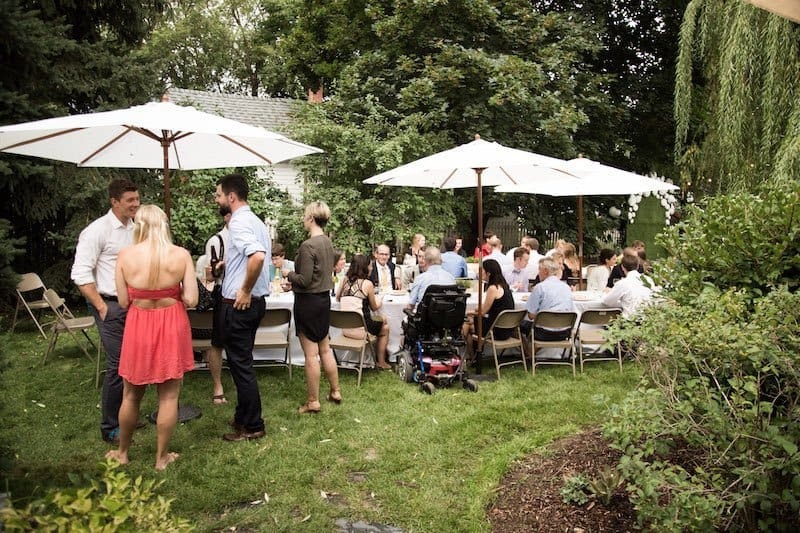 We had our wedding of 100 guests plus the wedding party on our 0.4 acre city lot (that’s our total lot size, so the yard is maybe half of that once the house/driveway/garage/utility areas are subtracted). If we had a smaller yard, we simply wouldn’t have been able to invite that many people. They would not have fit! Yard size is a great excuse to keep your guest list small if you’re having a garden wedding. To get a feel for how many guests you’ll be limited to, get some chairs from around the house and place them outside. Mock up a few tables and plan the routes that your guests will be taking. When you’re planning the wedding, it’s easier to invite more people in an effort to appease everyone. When you’re actually getting ready for the day and during the day itself, it’s way easier to have fewer guests! Decide which is more important to you before finalizing the guest list. Although we had sunny skies for most of our garden wedding celebration, there was also a crazy rainstorm for about 15 minutes right in the middle of the party. It had been so hot all day, but just as dinner was ending, the rain started pouring (accompanied by some rather strong winds). That was definitely not in the plan! But hey, it all worked out fine. If you are planning a garden wedding, you NEED to have a backup rain plan. This should include what to do in case of just a few drops as well as what to do if a complete rainstorm moves in. It’s extra work and potentially extra money, but you’ll be so much more relaxed in the days leading up to the party. We chose to rent the church that is immediately next to our house as a backup venue in case it was a totally rainy day. The church offered a package where their minister would officiate our ceremony, plus we could use the church for the ceremony if required. We also used the church for parking and for bathrooms for our guests. We likely could have used our house bathroom and street parking if we had fewer guests, but with 100 people…the church next door was a much better option. The church next door also had fridges and a kitchen but we didn’t end up using them. A family friend lent us some fridges to put in our garage and the restaurant brought the food already prepared. It was nice to have backup amenities at the church though. The great part about having a garden party for your wedding is that most of the decor is already dealt with in the form of the garden itself! We did buy a few new plants for our wedding, and I did spend a lot of hours getting the garden ready, but all of that investment is still paying off today. 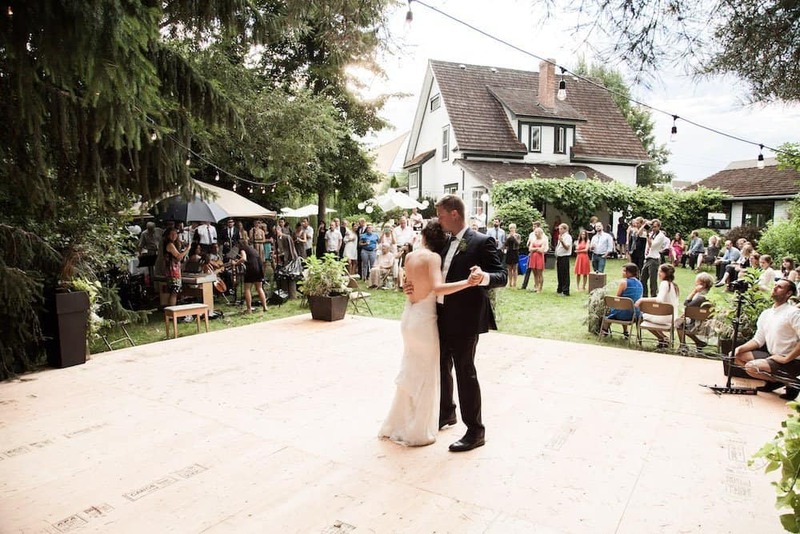 One big, basic item that we needed for the garden wedding was a dance floor. We wanted to have a sturdy ceremony surface that also acted as a central hub during the reception. We also wanted a dance, and having a dance floor just made it seem so much more fun. Fortunately my hubby, brother, and dad are very handy and were able to whip up a huge ceremony surface/dance floor one morning the week before the wedding. They framed it up with 2” x 4” boards and sheeted it with sustainably-sourced plywood. It was definitely so much fun to have! As a vertical backdrop for our ceremony, I kept it simple and just bought 2 large pieces of white linen. We draped them from the treehouse in the backyard to create a simple backdrop. It wasn’t the fanciest thing, but it did create a focal point. As a gardener, the flowers at our wedding were very important to me! I wanted local, organic, sustainably-sourced flowers (of course…. ), and was willing to pay a bit more for them. We connected with a lovely local farmer who provided beautiful dahlias and greenery for the bridal bouquets, boutonnieres, and a few decor pieces. She made a stunning wreath from succulents and greenery for the front of our house, as well as some lovely table runners featuring the Cafe Au Lait dahlias that were in season during our wedding. It was well worth it! Perhaps my favourite floral decoration at our wedding wasn’t the flowers we purchased, but was actually made by two of my aunts. My aunts made a gorgeous dark green foliage swag for the front of our house. It made the whole property feel so festive! 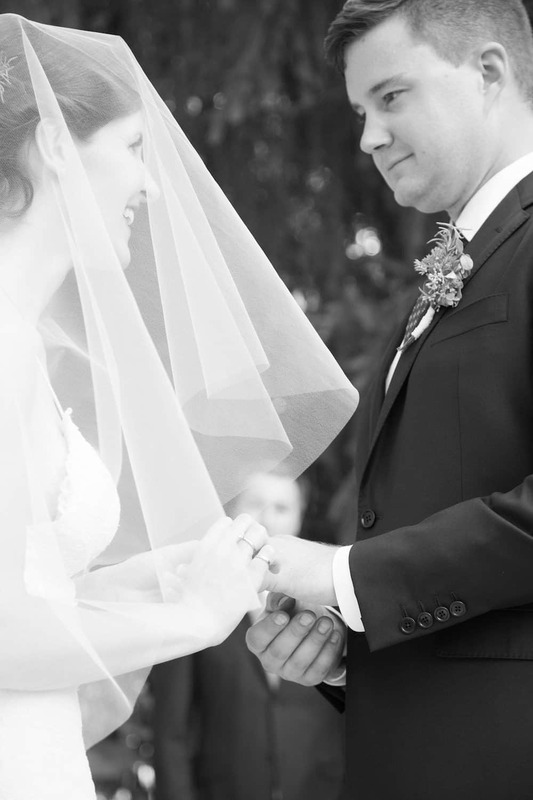 Rather than planning the day according to tradition, we decided to plan the day in a way that best suited our guests. We were inviting a large number of guests (100 guests in the end) and we wanted them to have a great time. If we weren’t focused on our guests, we would just have eloped. We decided to host the wedding in the late afternoon. It can get very hot in the summer where we live, so having an earlier wedding would have meant hours of uncomfortable outdoor heat for our guests. We also did not want our guests to have to spend the entire day at our wedding. By starting in the late afternoon/early evening, we gave our guests a chance to spend the day at the beach or with their families prior to attending our wedding. This also allowed same-day travel time for some out-of-towners – possibly saving them the expense of an extra night in a hotel. At this point I should mention one of my pet peeves about weddings – it’s when arriving at a wedding doesn’t feel like arriving at a celebration. Since we’re not particularly religious, our wedding was basically a party to celebrate a marriage. It is totally possible to have a wedding/marriage without a big ceremony and reception…so if you’re going to have a big party at your wedding, you might as well make it feel like a party. So why am I mentioning this? Why is it that when you show up at a party you’re generally greeted, brought into the party, and usually offered a drink immediately. At a wedding however, you often have to find your own way to the ceremony location and then wait over an hour before getting even a glass of water!? This is crazy to me. I might be alone in that, but hey, it’s how I feel. If I invite people over to my house, especially to the yard under the blazing sun, I’m going to offer them a drink when they arrive. 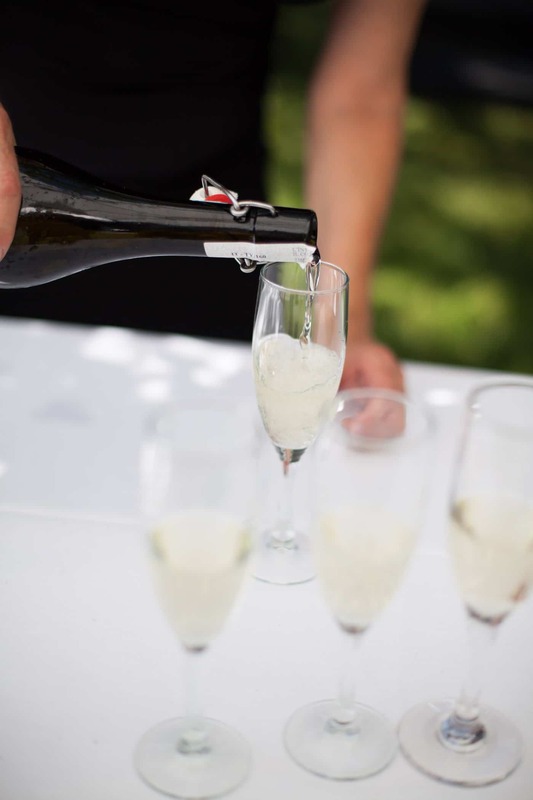 At our wedding, guests were greeted in the front yard with a “welcome drink” of sparkling water or prosecco and then escorted to the ceremony location in the backyard by the junior attendants and groomsmen. We kept things from getting out of hand alcohol-wise by having my hilarious and also kind-of strict high-school french teacher serve the drinks. She is amazing. Most of our guests know and love her, and were definitely not about to down a half-dozen drinks with that supervision. It worked out really well! If you’re having a party at your wedding…please have someone wonderful there to properly greet your guests as they arrive! Another careful choice we made was to take the majority of the wedding photos prior to the ceremony. This meant getting ready sooner in the day, but then we weren’t worried about leaving the party after the ceremony to have photos taken. Our friends and family came from all over the country to hang out with us on our special day. The last thing we wanted to do was leave the party to take photos when we had so many family and friends gathered together! So what is the point of all this wedding timeline talk? Basically, my thought on the matter is that if you’re going to invite guests to your wedding (or any party), it’s courteous to think about their needs and their comfort in all stages of planning, including the timeline. These are your most treasured friends and family…treat them that way! As expected, we used a spreadsheet to organize the wedding. This included the budget, actual spend, task lists and other various items. We colour-coded tasks were colour-coded based on category and sorted by the person responsible for the task. The screenshot above is from a working version of one of the earlier spreadsheets..it’s definitely not perfect but it worked. 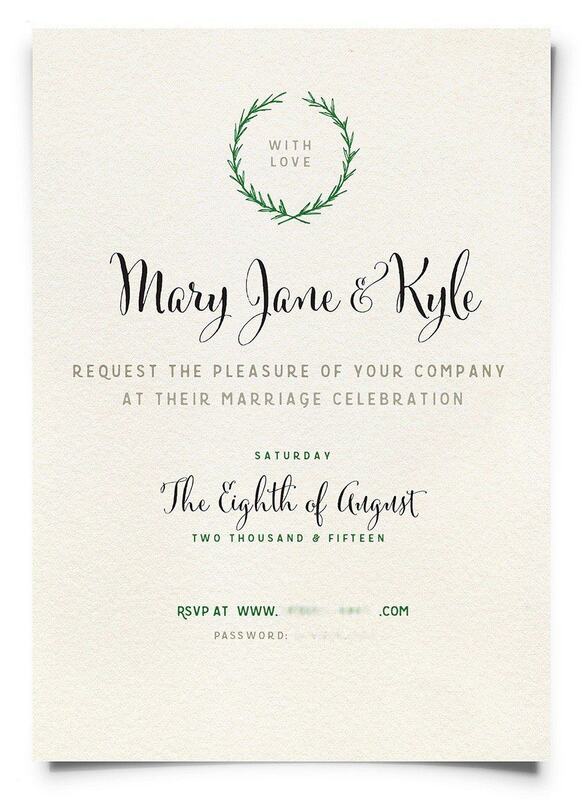 Rather than going for formal invites, we decided to send e-vites for our wedding. This choice was aligned with our goal of not wanting to feel stressed about spending too much money on a single day (and a single party). Having formal mailed save-the-date cards and invites would have been lovely, and I’m sure I would have enjoyed designing them, but it just wasn’t important enough to justify the cost of designing, printing, and mailing them. I designed a simple graphic email with a lot of help of my aunt. She is a graphic designer so I definitely lucked out there. 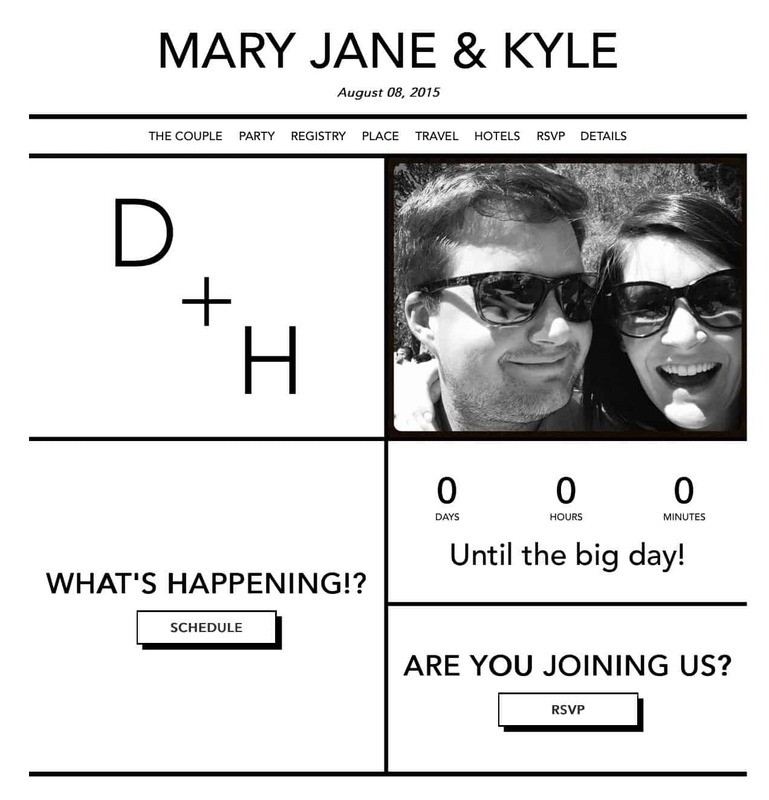 I also set up a simple website for our wedding. The email invite contained the basics while further details were found on the website. The site included directions to our house, hotel booking info, bios of our wedding party, and info about local attractions and favourite restaurants. We did choose to mail thank you cards, as it was important to me to properly thank our guests with hard-copy posted cards. I was able to get a great deal online (Zazzle) with a coupon code and order some thank you cards that matched our theme. One area that we did not skimp on was photography. One of our main goals was to create a memorable celebration to start our marriage surrounded by those we loved. Having clear photos to look back on was a key part of maintaining this goal in the future. Prior to our wedding, I researched tons of photographers. I was looking for a casual style that could capture the feeling of the event rather than a formal photographer who focused on typical wedding shots. In the end, we hired a trusted local photographer and his team to shoot both photos and video of our wedding. I am SO glad that we invested in this, even though it was a significant cost. It’s important to pick a photographer that you like because you’ll be spending most of your wedding day with them! Planning what to wear for a garden party wedding can be very tricky! For our guests, we didn’t set a dress code. We just asked everyone to wear whatever they felt best or most comfortable in. Having our guests feel comfortable enough to enjoy themselves was a key goal for us, so setting a dress code for a backyard party didn’t make a lot of sense. I hate being told what to wear. 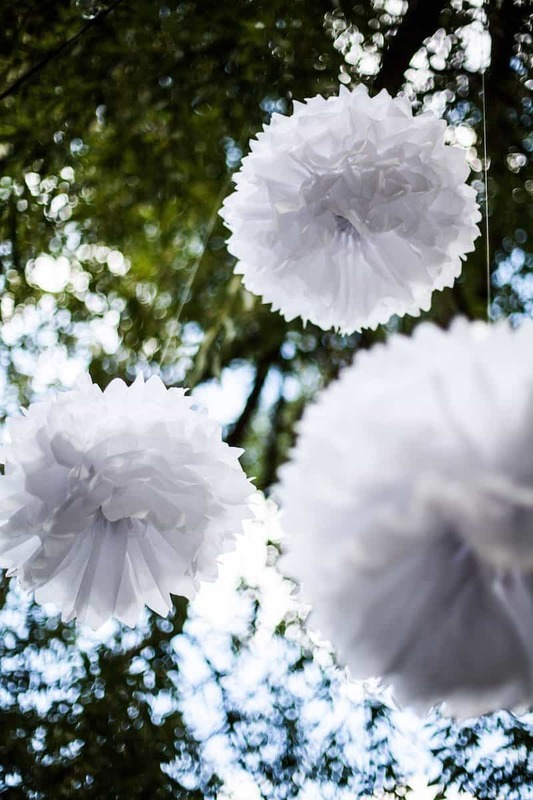 Finding the right thing for an outdoor summer wedding can be so tricky in the first place without extra specific instructions from the bride. For the wedding party, we did make an attempt to coordinate. My husband and his groomsmen wore suits that were either grey or navy. The groomsmen already had suits in these shades so they didn’t have to purchase anything new for the wedding. 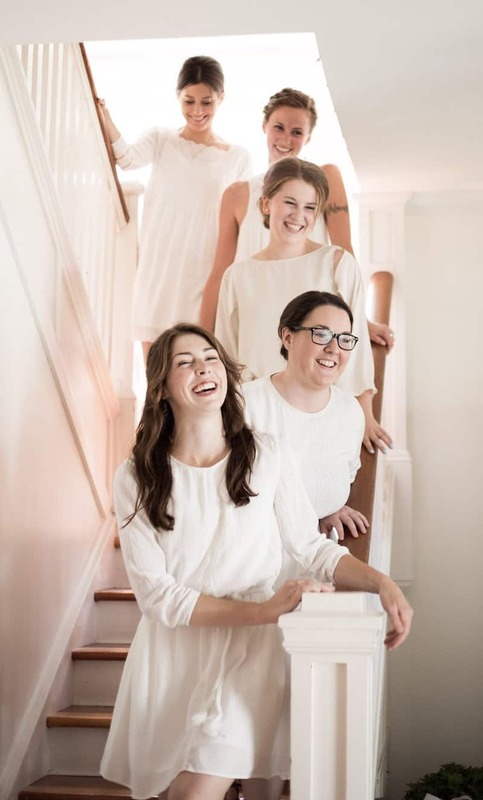 For my bridesmaids, we went shopping together at a regular clothing store that I knew carried lots of dresses in similar cream shades. They each picked something they felt best in. It was more affordable for me to buy these dresses for them since they were from a regular clothing store (not a wedding boutique), plus they didn’t get stuck with a “bridesmaids dress” made of bad polyester. For my wedding dress I first went shopping at some incredible dress stores in the big city. Of course I tried on some stunning dresses that cost thousands of dollars. It was fun, I have to admit, but it just didn’t make sense in the end. I had saved up the money for the wedding, but decided that the mental stress of paying a giant dress bill from that hard-earned savings just wasn’t worth it. I knew how long I had to work for each of those dollars and I couldn’t justify spending such a colossal sum on something that really only benefitted me (and only benefitted me slightly more than something much more reasonably priced). This is the dress I had pictured wearing, but it cost more than all of the cars I had owned at the time…put together! Apparently Olivia Wilde wore it on a red carpet. Obviously this dress did not happen. Look how happy I am trying it on though! 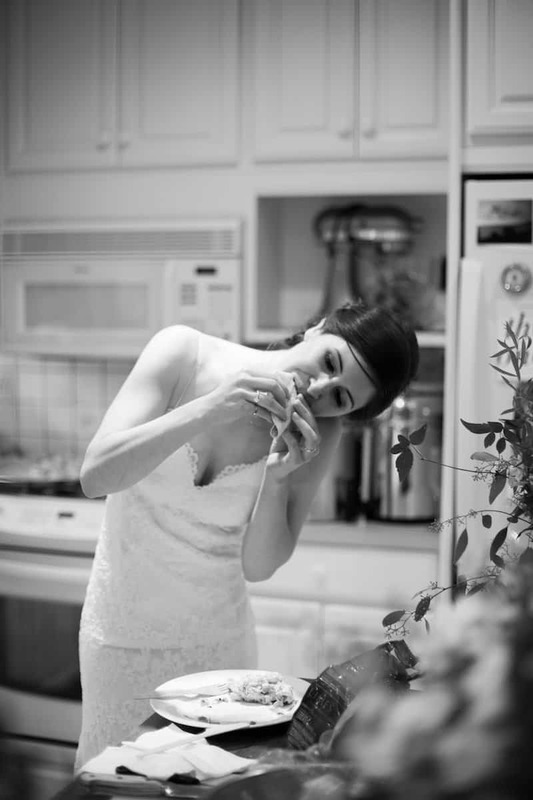 You can’t have it all sometimes, and that’s ok (even on your wedding day). What will suit the theme of the party? What will withstand being served outside? What will the guests like to eat? What is available in your local area? With these questions in mind, it was easy to select the food for our garden wedding. For post-ceremony appetizers, we went for a farmers market theme. Family friends went to the actual farmers market the day before the wedding and purchased local fruit and vegetables to serve. We also purchased some meat and cheese from the city to serve on charcuterie boards. This was the easiest for everyone involved, and no one went hungry. Our goal wasn’t to create a culinary experience with the appetizers, it was simply to make sure that everyone had some good food to enjoy (and that no one had to spend days making it). For the dinner, we went pretty informal. I’ve been to a lot of weddings, and I’m almost always uncomfortable during the formal seated dinner. I don’t like being assigned a seat, and I don’t like having to wait for my table to be called up. The whole thing just didn’t feel like “us”, and so we decided not to do a formal dinner. Instead of setting up formal tables with assigned seating, we set up glorified picnic tables for our guests. Dinner was served on an as-requested basis for an hour and a half during the party. Guests were able to take a break from chatting, grab some food, and then get back to the party. We only had to set up half as many table spots as guests because everyone was eating at different times. We were also able to serve “fun food” because of the rolling style of the dinner. I was even able to compost the cutlery and put it in my garden. I still smile when I find tiny bits of aspen forks in the garden. What “fun food” you ask!? Well…I LOVE tacos. They’re my favourite food, so I wanted to have tacos at the wedding. Who doesn’t love tacos, right!? It turned out that a couple of our guests might have appreciated a more formal plated meal, but the majority was totally cool with having normal summer outdoor food. The best part about dinner was that we were able to get our favourite local restaurant to do the catering. There are not really any caterers in our town so we were very lucky to be able to book a restaurant to do the food (there aren’t many restaurants here either)! The folks from this restaurant were an absolute joy to have at our wedding, and I wouldn’t have had it any other way. My choice to serve tacos was a good lesson that you can’t please everyone. Everyone has a different idea of the perfect wedding, so everyone will have a few things about yours that they’d change if they were hosting. If the majority of your guests enjoy the majority of your wedding, and you have fun too, that’s something to be very proud of! Drinks were a very important area of planning for our wedding. The first thing we had to do was to organize a bus shuttle to/from the hotel for guests who were drinking. We were able to rent a bus from the local school district…not very fancy, but it did the trick and no one had to drive if they didn’t want to. One key decision was not to charge for drinks. 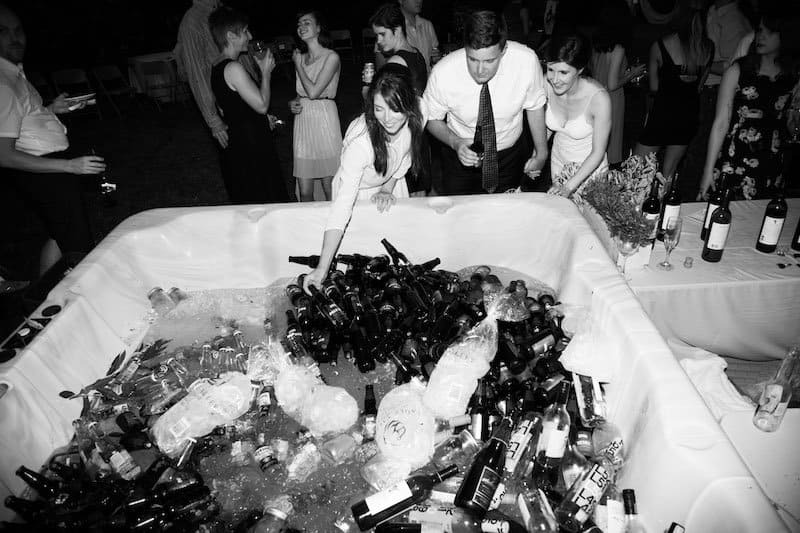 A wedding is a party, and if you’re going to throw a party, you kind of have to take on everything that goes with that. I’d recommend inviting no more guests than you can comfortably afford to host. If you really feel you must invite more guests than you can afford to host, a full-on potluck seems like a more reasonable way to make things work. We decided to focus on beer and wine rather than offering a full bar, partly out of simplicity and also to keep costs reasonable. We picked 5 local wines (plus a local bubbly!) that our guests could choose from. My brother gave us a wonderful wedding gift of supplying and dealing with the beer. He ended up filling our entire hot tub with ice and beer, which was hilarious and provided a bit of entertainment. We did have a mixed feature drink made with vodka served in mason jars, and had a scotch bar later on in the evening, but we saved a ton of time and effort skipping the mixed drinks. We would have had to hire several more bartenders if we’d have served mixed drinks. So what did this all cost? It did cost a lot for a single party. I still do think however that our wedding cost much less than a traditional wedding with 100 guests (plus I like to think we had more fun). I had been saving, so we were able to pay for everything out of pocket rather than using credit/debt. Taking on debt to pay for a wedding seems like a real bummer of a way to start a marriage, so I did not want to take on debt for this party. I did want to host a memorable event that started off our marriage in a celebratory way, surrounded by friends and family (who were hopefully having a good time too). I tried to balance both while keeping it real. Here’s what it ended up costing. Please note that some small material values are estimated due to my haphazard record-keeping of cold-hard-cash spend at the hardware store and other small local vendors at the time. All values are in Canadian dollars. It does seem like a lot to spend on a single party! I do feel that it was the right way for us to start our marriage. We were able to throw a memorable celebration for 100 of our family and friends without going into debt. 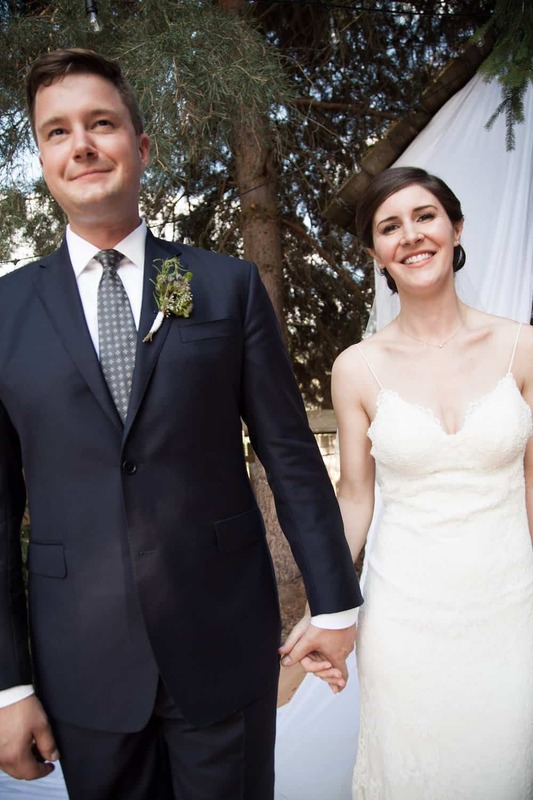 We did end up spending some additional money for tips and some odds and ends, but the above should give a pretty good idea of what it costs to host a backyard wedding for 100 guests in small-town Canada. Our plan was to keep it under $25K and that turned out to be a reasonable target. Friends and family are amazing! Accept their help and thank them over and over. Yes, it will rain. Even in August. Everything will be fine. Do your own thing and your day will represent you. You can’t please everyone, but if the majority is happy, things will be fine. It’s ok to host a non-traditional wedding as long as it’s non-traditional in your own way. You’ll forget what it all costs once it’s over if you’ve pre-saved the money. Arrange a shuttle. Even if it’s a dorky school bus, it will keep people safe. Filling your hot tub with ice chunks and bottles may cause permanent damage to it. Are you considering getting married in your backyard? Thinking about hosting a garden wedding? Share your stories and questions in the comments section below! I won't send you spam. Unsubscribe any time.